Blend and grind dry and wet ingredients efficiently with the Bajaj 750 W Classic Mixer Grinder. 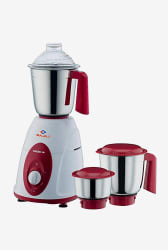 This 18000 RPM mixer grinder enables you to grind spices, and prepare chutneys, batters and milkshakes in minimum time. It comes with a 1.5-litre liquidizing jar, 1-litre dry grind jar, and 0.3-litre chutney jar for versatile use. With its 3-speed setting, this mixer grinder enables you to grind ingredients to the desired consistency.